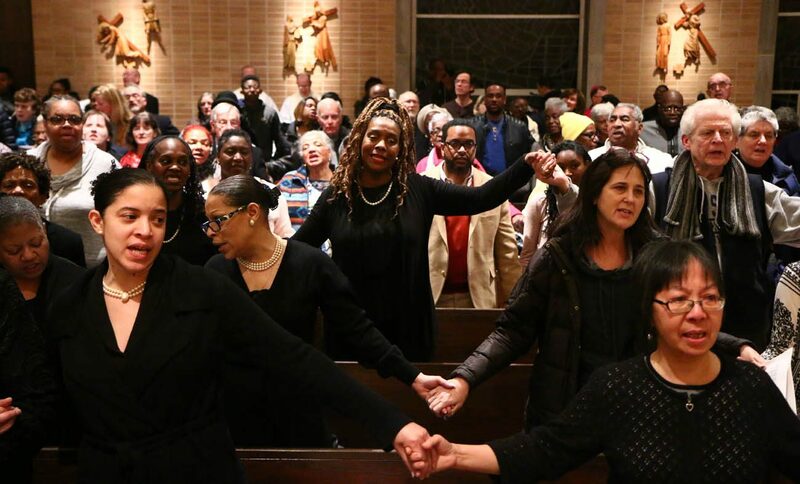 Participants gather at St. John Chrysostom Parish in Wallingford for an interfaith prayer service on Martin Luther King, Jr. Day, Jan. 15, 2018. Archbishop Charles Chaput presided at the event, which has been held at various parishes in the Philadelphia archdiocese for the past 35 years. People across the Philadelphia region celebrated Martin Luther King Day on Monday, Jan. 15 by working together to give back to their communities. To mark the occasion, St. John Chrysostom Parish in Wallingford, Delaware County hosted the interfaith prayer service, “Building the Beloved Community” on Monday evening. Archbishop Charles Chaput led the service and was joined by a capacity crowd of some 900 people of various faith traditions from all over the Archdiocese of Philadelphia, 400 of whom enjoyed a social gathering afterward. The archdiocesan service, now in its 35th year, traditionally had been held at parishes in Philadelphia but was moved to the suburbs and held at St. Philip Neri in Lafayette Hill last year before making its way to Wallingford. Father Hallinan previously served as pastor of St. Martin de Porres Parish in North Philadelphia, and because St. Martin is the patron saint of social justice, Father Hallinan was especially honored to host a prayerful event on this important holiday at St. John’s. A group of approximately 15 faithful parishioners spent many hours planning the service over the past three months. Among them was Mary Chollet, director of parish ministry and communications. 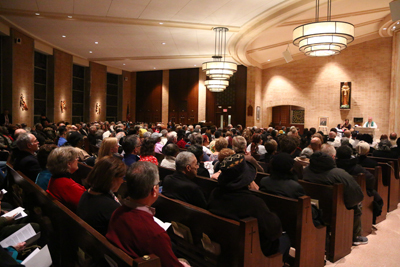 The parish has maintained a decades-long commitment to interfaith dialogue, and its experience with building relationships with other faith communities enabled St. John’s to host this archdiocesan event, according to Chollet. The St. John’s Choir performed prelude music under the direction of Music Minister Patti Georges. Capuchin Franciscan Father Richard Owens, director of the archdiocesan Office for Black Catholics, gave a brief welcome after which the Philadelphia Catholic Gospel Mass choir, directed by Kenyatta Arrington, led the congregation in the gathering hymn, “Lift Every Voice and Sing.” The choir later led the hymn “We Are One” at the service. Several members of the clergy participated in the Liturgy of the Word including Rev. Mr. Manuel Flores, a transitional deacon from St. Charles Borromeo Seminary, who read from the Gospel according to St. John. In his homily, Archbishop Chaput talked about how Martin Luther King Jr. gave his life to God. A collection was taken up to benefit the Msgr. Mitchell Scholarship Fund begun in 2008 by Cardinal Justin Rigali to honor Msgr. John T. Mitchell, an archdiocesan priest from 1939 to 1981 who was especially known for his service to African-American Catholics. Among the young people in attendance were high school students from Cardinal O’Hara, West Catholic Preparatory, Archbishop Ryan and Mercy Career and Technical High School. They spent their day outside of the classroom participating in service projects at Project Share and the St. Katharine Drexel Food Pantry. Anirah Drew, a senior at West Catholic, worked at the pantry clearing boxes and other old supplies. Cardinal O’Hara freshman Gavin Lewis enjoyed the day but also understood the deeper meaning behind serving others. Before the end of the prayer service, Father Owens took the time to talk about what it means to be a disciple of Jesus Christ. I am a member of the Philadelphia Catholic Gospel Mass Choir. My Choir, directed by Kenyatta Arrington, participated and sang ” Lift Every Voice and Sing” and “We are One” at this prayer service. Some of the Choir members are in the photo. Unfortunately, the article did not mention that this Choir also sang at this service. A spiritual, faithful and diverse service. Thanks to the Philadelphia Archdiocese Office of Black Catholics Apostolate and St. John Chrysostom. Looking forward to next year!